DONETSK, Ukraine -- Russia’s foreign minister accused the interim authorities in Kiev on Monday of flagrantly violating the international accord reached last week aimed at defusing the crisis in eastern Ukraine, in remarks that suggested Russia may be further preparing the groundwork for a military intervention. Russian soldiers in Donetsk, Ukraine. The foreign minister, Sergey V. Lavrov, leveled the accusations as Vice President Joseph R. Biden Jr. arrived in Kiev in a show of support for its increasingly besieged government, which the Kremlin regards as a product of a Western-backed coup that seized power in late February after months of protests. Russia annexed Ukraine’s southern Crimean Peninsula last month in response to the crisis in Ukraine, and Mr. Lavrov’s accusations suggested the Kremlin was creating a basis to justify a similar territorial grab in eastern Ukraine despite its repeated denials. Thousands of Russian troops have been massed on the border for weeks. The Obama administration has warned that it will impose increasingly harsh sanctions on Russia if it does not help defuse the crisis in eastern Ukraine, which the West has accused the Kremlin of manufacturing in a “masked” war. But Mr. Lavrov threw that warning back at the Americans in his angry assertions at a news conference in Moscow. “Before giving us ultimatums, demanding that we fulfill demands within two or three days with the threat of sanctions, we would urgently call on our American partners to fully accept responsibility for those who they brought to power,” Mr. Lavrov told reporters. He rejected accusations that Russia is covertly manipulating events in eastern Ukraine and subverting the accord reached in Geneva on Thursday among himself, Secretary of State John Kerry, and representatives of Ukraine’s interim government and the European Union. “The authorities are doing nothing, not even lifting a finger, to address the causes behind this deep internal crisis in Ukraine,” Mr. Lavrov said. Mr. Lavrov blamed the interim government and its sympathizers for the killings of three people in a shootout at a checkpoint in eastern Ukraine on Sunday. “The fact that extremists started to shoot at unarmed civilians is unacceptable,” he said. Also on Monday, new evidence of violence aimed at pro-Russian militants in eastern Ukraine emerged, with the bodies of two members of a Moscow-backed militia pulled from the Donetsk River in Slovyansk. As with most other issues, Moscow and Kiev each blamed the other for the violence. Vyachislav Ponomaryov, the de facto mayor of Slovyansk appointed by militants, told the Russian newspaper Moskovsky Komsomolets that he had identified the two bodies pulled from the river as pro-Russian militants. They had died, he said, from stab wounds and been thrown in the river. Mr. Ponomaryov said the city was under attack by a Ukrainian nationalist group, Right Sector, and the Ukrainian Army, although there has been no clear sign of either since a Ukrainian armored column surrendered to the separatists in a humiliating setback for the central government last week. 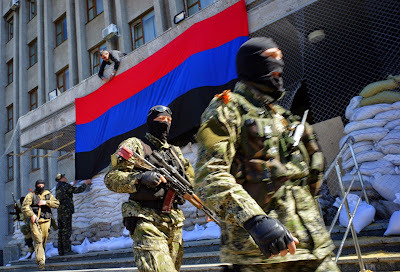 Ukraine’s Foreign Ministry issued a statement on Sunday dismissing the assertion by pro-Russian militants that attackers in and around the city were members of the Right Sector. The group also denied any involvement. Over the weekend, armed men in masks robbed the homes of several of the 150 Roma families in Slovyansk, demanding gold and money and telling the Roma that they should leave town. “They pointed a gun at me and said: ‘Where is your gold? Where is your money?’ ” Natasha Cheripovskaya, 45, said in an interview in her ransacked living room. About a dozen masked men entered the house on Friday, she said, and stayed for about two hours, holding her and a granddaughter at gunpoint. The men fired bullets through windows and shot and killed the family’s dog, which was barking, leaving a bloodstain in the yard, she said. “The neighbors saw it all but were afraid to say anything,” she said. Ms. Cheripovskaya said seven of the town’s Roma families had been attacked. She decided to leave immediately with her husband, six children and eight grandchildren, who were packing belongings in three cars through the afternoon Sunday. At some Roma houses in town, knocks on the door brought only a fearful peep through the blinds inside, then silence. Mr. Ponomaryov, the “people’s mayor,” told journalists that the attacks on the Roma were not motivated by ethnic hatred but an effort by his men to rid the town of drug traffickers, who he said were Roma. “There were no attacks on Roma as such,” he said. The shootout on Sunday at a roadblock run by pro-Russian militants near Slovyansk left at least three people dead, highlighting the fraying in eastern Ukraine of the Geneva pact. Around 2 a.m. on a road lined with blossoming apricot trees, four cars drove toward the checkpoint, according to the pro-Russian militants who control the city. The occupants then opened fire, killing three local men who were standing guard, the militants said. “We thought nothing would happen because it was the holy night,” said Yevgeny Bondarenko, 62, who said he had been there to celebrate Easter with the people at the checkpoint. It was unclear whether the shooting was an event staged by provocateurs, an accident or an attack on pro-Russian militants. Though the Russian Foreign Ministry cited the violence Sunday as a truce violation, it was hardly the first shooting in Slovyansk since militants distributed the contents of a police arsenal to local men a week ago. Certain details at the scene supported that claim: unburned, out-of-town license plates were propped on the charred vehicles on the road, an apparently heavy-handed attempt to suggest an attack by outsiders. The United States has said it would impose additional sanctions on Russian businessmen, and possibly on a bank or oil company, if the Geneva accord was not heeded.